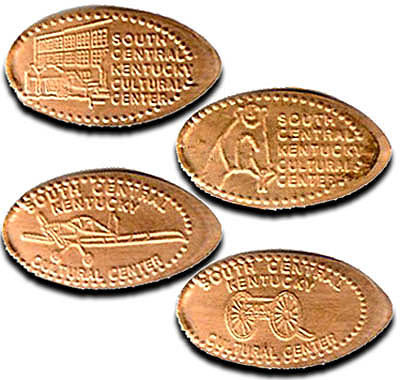 The South Central Kentucky Cultural Center is dedicated to telling the story of the people, places, and events that make up the geographic area known as the "Barrens" - Metcalfe, Allen, Hart and Monroe Counties, as well as Barren County. The Museum is housed in the old Kentucky Pants factory in downtown Glasgow. The penny machine is located inside the gift shop, and admission to the museum is not required to access the machine. The gift shop staff told us that they are looking to sell the penny machine because it is under performing financially (perhaps because their squished pennies are $1.01 each, rather than the usual 51¢ or 76¢?! ), so be sure to collect these pennies while they are still available!